My son and I thought this book was so adorable because we love whales and also because it was written and illustrated by 5 year-old Alexander Luke! The book is presented by his grandmother, award-winning children's author Carole P. Roman. Whaley is a blue whale (largest of all whales) and he sets off on a big adventure to explore the different types of whales in the ocean. As we read along, we get to explore these whales with him. We learn about orcas, humpback whales, gray whales, belugas, sperm whales and the whale shark. The illustrations are cute and quite good drawn from a five-year old, which also gives the book the feel of an authentic kid's work. 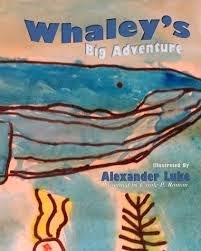 This is the perfect book for kids who love whales and learning about animals. Way to go young Alexander for publishing your first book! Disclosure: Thanks to the publisher and Bostick Communications for sending us this book for review. We were not compensated in any other way, nor told how to rate or review this product.